A man who once tried and failed to topple Moammar Gadhafi in the mid-1980s has returned to the scene as Libya struggles to free itself of largely Islamic militias and bring its energy industry back to life. Gen. Khalifa Haftar says he's just the man for the new job at hand. The self-declared leader of the Libyan National Army says that if he is successful at ridding Libya of Islamic militants, the next step will be elections. Speaking over the phone with CNBC from his headquarters in Benghazi, Haftar said:"Our mission lies in the removal of the fundamentalists that came to Libya from abroad." 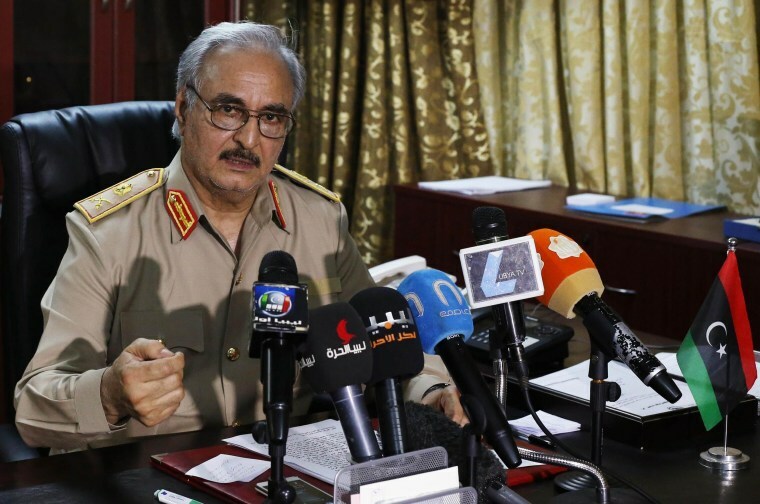 Haftar re-emerged this month when forces loyal to him blasted Islamists in Benghazi and Tripoli (read our previous article here). He said he will continue to use force to rid the country of foreign fighters from "Afghanistan, Pakistan, India, Algeria, Tunisia," and then follow with elections. "Once that happens, we will have elections. We will need enough time to prepare for those elections and then the Libyan people will decide," he said. "The main goal, the most important goal here is the stability of the country." "The majority of them are fundamentalists, in fact, terrorists," he said of Islamists who have wracked the nation with violence since the overthrow and killing of Gadhafi in 2011. "So we have to use force with them." Having spent nearly 20 years living in Virginia, and reportedly having been involved with the CIA in the 1980s during a failed coup attempt against Gadhafi, one oil executive involved in Libya who requested anonymity said it's widely assumed Haftar is backed by the CIA. Haftar denied that he receives support from the United States or any other foreign governments. His army "doesn't get any support from the U.S. or from Saudi (Arabia) or Egypt," he said. "The support that they get is only internal." Convincing international oil companies to invest in Libya is turning out to be a pretty hard sell for Libya's embattled central government, which lacks the cohesion or military and financial wherewithal to secure the country. At the opening of the third New Libya Oil and Gas Forum in London this week, a member of the Libyan Oil Ministry told attendees that "recent events should not deter you from being there. Terrible events can happen anywhere in the world." But the timing of the conference couldn't be worse. This week, the U.S. State Department said all Americans in Libya should leave immediately due to a sharp spike in violence. Meanwhile, oil production has plummeted to only 165,000 barrels per day, a mere fraction of the more than 1.5 million barrels it churned out daily in 2012. Today, two different men claimed to be prime minister, and the rise of what some call a "rogue" general in Haftar is raising the question of whether another military strong man is trying to come to power, even as his promise of stability is welcomed by a violence-weary population. "It's depressing, really," said geologist David Boote, an attendee at the conference. "From an exploration point of view, we can't do anything. There's no way any company can do any work there and not worry about getting killed." Dan Clark-Lowes, who specializes exclusively in the petroleum geology of Libya, isn't seeing much interest from clients anymore—which is a hit to his revenue. "Not many international oil companies are really seriously going into the country at present," he said, "so that's a large part of our client base." Since the fall of Gadhafi, the OPEC nation's oil production has been an up and down affair. But the situation began to worsen 10 months ago as competing militia groups, some of them filled with Islamic extremists, began taking over the country's oil facilities and ports. With no real police force or cohesive military to speak of, the militias have had the run of the place, while parliaments and prime ministers have come and gone. "When the Arab Spring happened, I felt sure somehow that Libya was the one place it might work, because it has a small population and very, very large oil reserves," said the geologist Boote, who runs a firm called David Boote Consulting. "Compare that to Tunisia or Egypt, where they have very large populations and comparably small oil reserves…But now they're all squabbling over it." "I believe that these problems are expected, building a country from scratch, because that's exactly what we're doing in Libya," said attendee Naaman Elbouri, chairman of oil services company Trans Sahara Group. "We've got no institutions, no constitution. We have no army, no police force. So everything had to be built from scratch. You know obtaining democracy and freedom is no easy task."